Showcase your passion for pies with this whimsical pendant featuring heart-shaped toppings. We want to know how many people have found love in a pizza shop. Some might say: All of us. 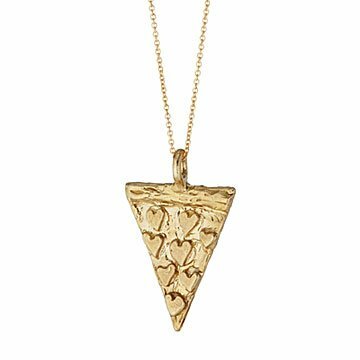 Inspired by her own passion for pies, Rachel Pfeffer designed this whimsical brass pendant, which features heart-shaped toppings and "A pizza my heart" stamped on the back. Because when it comes to true, heartbeat-skipping adoration, nothing competes with a slice. Gold fill 18-inch chain. Handmade in Washington, D.C. Adding some gold to my accessory collection is good. Normally I wear only silver, but this has just the right touch. My sisters and I grew up in a Sicilian neighborhood and enjoyed the best pizza there is! We gather together around a good pizza whenever we can!